Microsoft Word 2007 step-by-step instructions on how to change the line spacing your paragraphs. 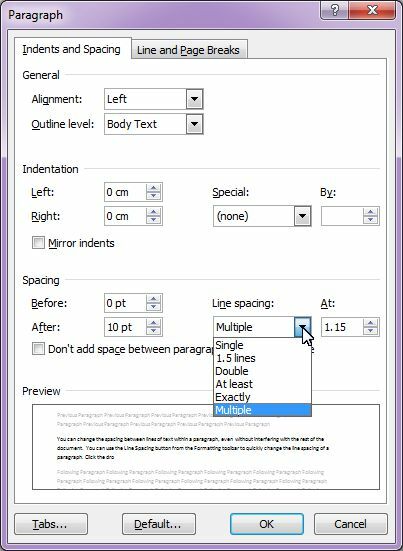 You can change the spacing between lines of text within a paragraph, even without interfering with the rest of the document. You can use the Line Spacing button from the Home Ribbon tab to quickly change the line spacing of a paragraph. Click the drop-down arrow next to the button and choose a line spacing you want. 1. Select the text you want to change the line spacing of. Choose Line Spacing Options from the Line Spacing button's drop-down list. These three options are quite up front about what they do, and self-explanatory, too. Choose this one if you want Word to adjust for tall symbols or other unusual text. Word adjusts the lines but makes sure there is, at minimum, the number of points you enter in the At box between each line. Choose this one and enter a number in the At box if you want a specific amount of space between the lines. Choose this one and put a number in the At box to get triple-, quadruple-, or any other spaced lines. You can get a sneak preview of what your lines look like by glancing at the Preview box. 4. Click OK when you've made your choice.